Why? Because as Christians everything we do should be for God’s glory. Everything, even what we eat and drink should be for God’s glory. That’s what 1 Corinthians 10:31 teaches. That’s a Christian life’s purpose. We do all things so that God would be magnified; we do all things to please the Triune God who has saved us from our sins and from the destination of God’s wrath in hell. Why would we Christians who have tasted the goodness of God, not want to glorify Him and love Him above all else? And if we love God first in our own lives and want others to also love God first in their own lives by edifying other believers to do the same and evangelizing unbelievers with the Gospel, how could we not also want the same in our spouse? So my brothers and sister not yet married resolve to only court someone who loves God before anything else! But there’s another (secondary) thought to consider why believers should court someone who loves God before anything else. The Person that Should be the Most Easiest to Love is God. This statement is true. But sometimes the reaction I get is how could this be true. We struggle to love God. We face many temptations every day, multiple times during the day that pull us away from loving God…and love things or people that takes the place of God instead. That’s called idols. But read that statement carefully. It says God “SHOULD” be the most easiest to love. Objectively speaking the most lovely Person is God. He is perfect. He’s the definition of Perfect. He does not sin. He is gracious beyond what we can imagine. He is love. He is awesome. Studying the attributes of God and Christian theology is not merely an academic exercise or a boring Sunday School routine but it is to love God! 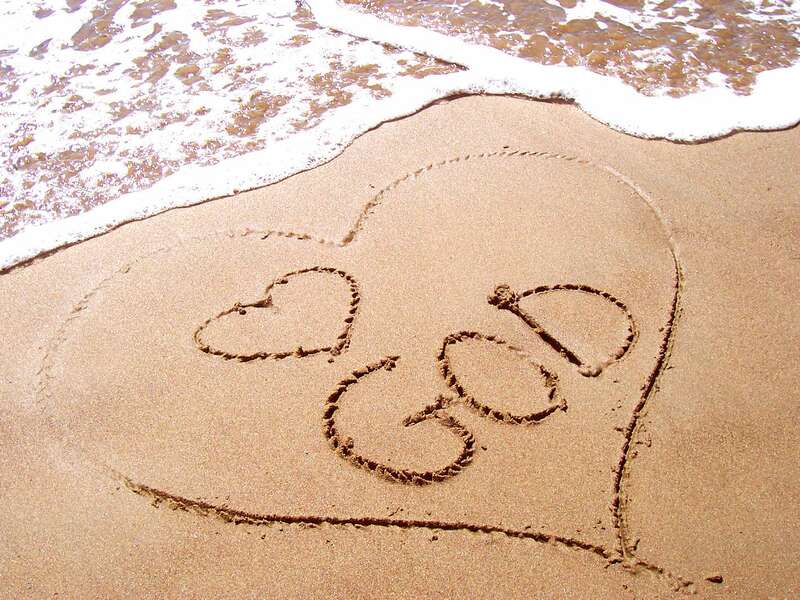 It is to learn more of why we should love God, and the reasons are plenty. Of course why we fail to love God (when He is objectively speaking the most easiest Person to love) is due to our sinfulness. When we talk about marriage and family sometimes kids will ask “Where do babies come from?” Likewise we should ask “Where do sin come from?” Every sin is conceived with a lie. A lie about God. A lie that something or someone else is more lovable than God. It is a lie about us as well. A lie that we will find more satisfaction in something or someone else more than God. But it’s not true. The height of greatest satisfaction and meaning is God and from God. The secondary reason why you want to court someone who loves God before anything else is this: If they can’t love Someone who is the Most Easiest to love and can’t find satisfaction, meaning and love in God, what makes you think they will find it in you, someone who still have a sinful nature? By the way the same is true for you: If you can’t love Someone who is the Most Easiest to love and can’t find satisfaction, meaning and love in God, what makes you think you will love someone who still has a sinful nature? Someone who will sooner or later disappoint you, annoy you, offend you and sin against you. We love God because He first loved us. That’s what 1 John 4:19 teaches. We don’t love Him to earn His love as our wages (that would be a wrong gospel); no His love is a gracious love. We don’t merit it. But we still love Him back because He loves us. Our love of God reveal our own character. When a man or a woman love the Most Easiest Person to love (God Himself) they understand the duty of love, and loving Someone back who loves them. That spills over into human relationship of courtship and marriage too. Also if you and your future spouse love God first because of His love for you it will carry you during your darkest, difficult and longest days of marriage. When the lists of both your sinfulness and quirks accumulate and if and when the Devil whispers softly into both your ears “Divorce,” a couple that have found that God is the Easiest Person to Love will lovingly obey God in loving their spouse primarily because God has loved them. Still that’s not even the full story. A person who constantly behold God’s love shown through the Word of God of Christ dying on the Cross for their sins will also be transformed into a more godly Christian. That’s the promise of 2 Corinthians 3:18. That means a more godly husband and wife over time which good effects will be felt through marriage. Look at 2 Corinthians 3:18 again. Notice it says “beholding His glory.” It will transform you. If we only behold the “glory” of our spouse it will eventually disappoint you. That is because the glory of any man or woman will fade; it will leave you disillusion, bitter and disappointed. But beholding the Glory of God has the opposite result: It will transform you! Again my brothers and sisters when considering someone as a potential spouse please court someone who loves God before anything else. But while you wait remember you have the responsibility of growing in loving the most Easiest Person to love: The Triune God who has demonstrated His love through the Gospel. Hi brother I’m still single I have no idea who God has for me or if I am to stay single but God knows. Thank you brother praying for me and the link. I did a post on Bible Prophecy and the Pre Tribulation Rapture check it out if you want to it’s up to you. You’re welcome. I’ll get around to your blog eventually, gotta get some things done first…how is your day going thus far? That’s fine. My day is going good thank you for asking how is your day going? My day is going well, listening to the video now. Also I’m about to evangelize in about two hours and trying to get some other work done before then; pray for us yeah? That’s good yes I will pray for you brother. Pray and God might give you a spouse you never know. Amen! I pray it would encourage God’s people who are single to not compromise and settle but hold to what is biblical concerning what to look for in a spouse. This moved me to tears. Beautifully written and gloriously Gospel centered. on October 3, 2018 at 2:09 pm | Reply Μιχαήλ (Michael) | God is in a good mood! Never thought of it this way, but it’s all true. Thank you for these words of wisdom, Jim! Thank you for those words of affirmation. I’m about to evangelize shortly pray for us if you are led. Great advice for unmarried believers. My wife and I both love the Lord and yet we still have times of disagreement and misunderstanding here and there. I could not imagine at this point being joined to an unbeliever or a seriously backslidden believer. Thank you Tom for sharing that; I know I didn’t say it in this post and I think you hinted at it but another reason to court someone who loves God when you love God is that you both can grow closer together as you grow in grace together. What sweet fellowship that would be, Amen? Amen! Yes, since I returned to the Lord four years ago, we’ve both strived to follow Him more closely through His grace, and our marriage is so much better now. He’s our “common” Rock and Shepherd so we don’t get too far “out of sync” these days. Oh, the messages I could post about the old days. Argh! Thank you, Jesus! What a good post, and wonderful counsel for the singles among us. This is even good advice for married couples, as the love of God should even be the primary love for married men and women. Thanks for reblogging this Wally! My pleasure, bro Jim, and prayers for your evangelism tonight. Where are you going? We’ll be at a college campus. I am down with only one guy this afternoon, and its a special needs brother. But I still want to evangelize and share the Gospel. Thanks for your prayers, it means a lot to me. I seem to remember you mentioning that brother before. All the best, and may souls be reached. What an encouraging read, it is all for God’s glory and not our own. Thanks for posting this SlimJim 😊. Absolutely so well spoken that should encourage not only singles but married couples as well…to the glory of God! Amen sister! This has implication for those who are married, thank you for the encouragement! “You are thinking about marrying a non-believer in Jesus? What is wrong with you? Don’t you know that if they don’t belong to Jesus they are a child of the devil? You want the devil to be your daddy-in-law? Huh…Do you? Y’all shoot from the hip don’t y’all? Jim, it is good to know that you teach your people these principles. It is lacking in most churches. How do you teach the difference between dating and courtship? Blessings for your week-end and the Lord’s Day.